Accommodation in Hartenbos: Riviera Coastal Inn and Suite Hotel. 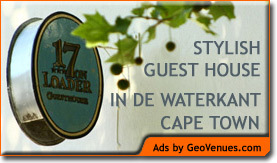 You are here: Home / Western Cape / Hartenbos / Accommodation in Hartenbos: Riviera Coastal Inn and Suite Hotel. Mossel Bay. The Pearl of the famous Garden Route! Rich in history, 2nd best all year round climate in the world. Breath taking views a combination of indigenous fauna and flora, unspoilt beaches, warm waters of the Indian Ocean and home to the world renowed “ Sharkville” documentary.Mosselbay was awarded safest town of South Africa in 2008, as well as cleanest Town of the year in 2007. It’s a one stop destination, with a diverse list of attraction like shark cage diving, hiking, deep sea fishing, bungee jumping and sand boarding to name but a few. Now that we appealed to your imagination, where better to stay in Mossel Bay than on the banks of the Hartenbos Lagoon, amidst abundant blessings of nature’s ambience and grandeur, The Riviera Coastal Inn offers a unique stay at the finest address in the Garden Route. Experience a fusion of “wave whispering” tranquility, homely atmosphere and real South African friendly service. Enjoy sunset, synonymous with a painting by God, a Breakfast with a view, as “through the eyes of an angel” or a walk on the soft, golden beach, maybe catch a glimpse of a passing whale, natures wonder. The Riviera Coastal Inn boasts with a wide variety of accommodation, from hotel rooms to self catering units. We are a family friendly establishment that can cater for groups up to 6 people in a unit. The Driftwood Restaurant is a gem situated in the heart of the Riviera Hotel. It’s the perfect restaurant for young and old. Upon entering you are embraced by the calm, spacious and peaceful environment. The Décor inspired driftwood and nautical theme is commonly noticeable through out, with a touch of sea blue undertone. Being on the bank of the Hartenbos Lagoon, the Driftwood Restaurant boast with a fusion of a view: Lagoon, Indian Ocean, outstretched beach, lush green plants on the embankment and the Outeniqua Mountains in the far side. The Driftwood Restaurant specializes in casual comfort food, prepared with love for your enjoyment. Words that one will compare with our dishes: South African, mouth-watering, value for money, wunderbaa, generous portions. Complimentary to the Restaurant is our Ladies Bar, unique boat design. Let our Barman entice you with one of his cocktail mixes, while enjoying a sunset on our deck. We also offer a small selection of local wines to compliment our dishes. The Driftwood Restaurant a must for all!